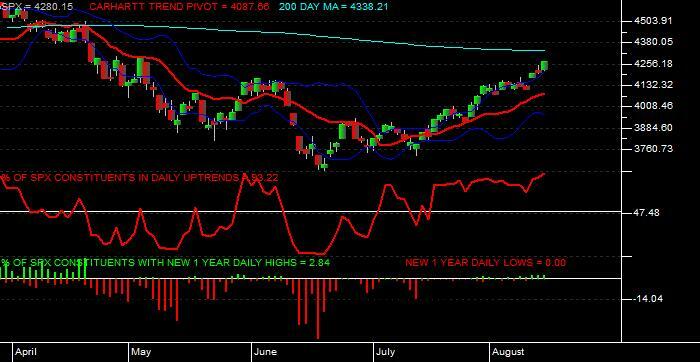 A proprietary indicator identifying the current trend of the subject security. Historical data from 1990 through the current date (or starting date of the index or ETF if later) is contained in the composite datafiles. An old market axiom is "Follow the Trend". This is true, but also as trends age there is a growing certainty of an eventual reversal. Readily "seeing" the current trend may provide opportunities for entering positions earlier to take advantage of such reversals in aging trends. In any case, knowing the current trend keeps trading perspective. In the chart above (top section), closes above the middle pivot line (red line) are defined as an uptrend, while closes below this line are indicative of a downtrend.